1. A friend had an extra ticket to last week's Beck/U2 concert at the Vikings Stadium, and offered it to me for free. We had a great time! 2. The day before the concert, I noticed a post on my company intranet about a nearby parking garage offering a free day of parking in exchange for a name and email address. I took advantage of it the night of the concert, so I didn't need to pay for either parking or an Uber. I'll get a few emails from this parking garage, which I can delete (or hang on to, if they are offering a discount on future parking) and I saved at least $20. 3. I had my kids try on every single piece of clothing they own, including all their winter gear. I also took their measurements from head to toe, and had them stand on a piece of paper to trace their feet for shoe sizing. Next weekend is my favorite local kids' consignment sale, and I plan to go on half-price day. Now I know exactly what they need (and what they don't! ), and what sizes to buy. 4. We're almost done with diapers! Baby Bear starts potty training this weekend. We use the Oh, Crap! Potty Training method, which means I am 100% confident that this is it and we will not be going back to diapers. What a milestone! 5. We just celebrated Pickle's fifth birthday (!!) 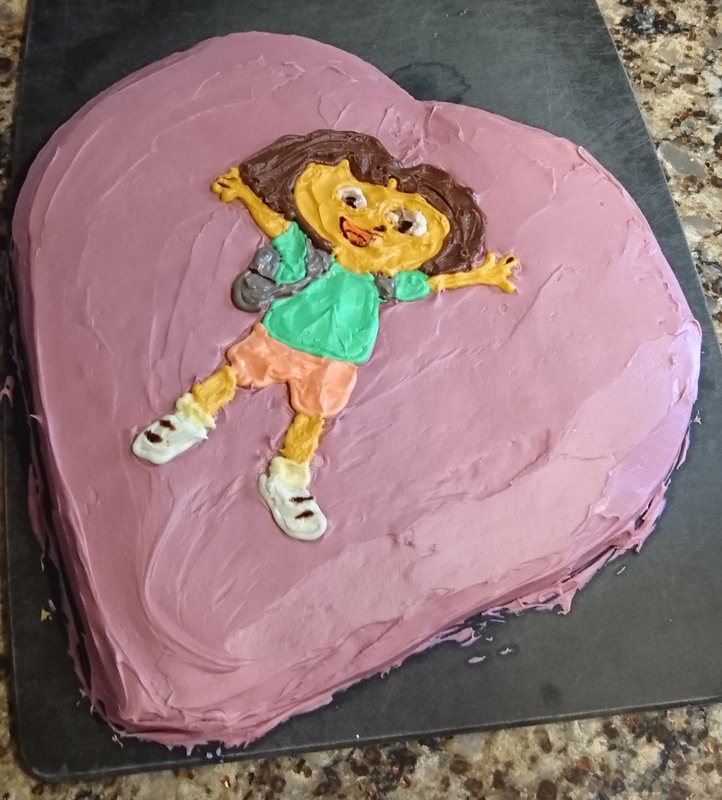 and she had a homemade cake that looks kinda sorta maybe like I had intended it to. The thing is, I didn't make that cake to win any awards. 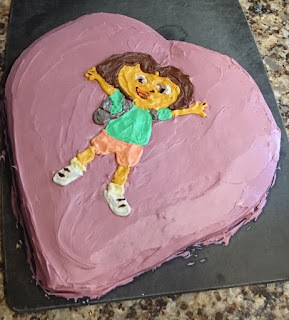 She really wanted me to make it, she wanted Dora on it, she wanted it vegan so her cousins could eat it - and she loved it. So it was a win, and it cost me about $5 compared to a store-bought vegan cake that would be at least $30+. We bought her one present (a kitkat bar), and we celebrated her and how much we love her and how glad we are that she is in our family. Especially for very young kids, their birthdays don't need to be expensive to be special. What frugal wins have you had this week? Is that a potty training regimen or just consultations to teach the kids? JB has been potty training for ages, we're not pushing very hard, but we're not quite there yet. I guess they offer consultations; I've just used her book (and I met her at a book signing a few months after Pickle was potty trained). What I love about her book and the unofficial Facebook group is how much of the training is for the PARENTS, not the kids. We are asking them to change something they have literally done their entire lives, and our expectations are unreal. Our frustration and stress levels deeply affect how our kids do with potty training, so it's really the coaching for the parents that is the most useful thing to me. I actually very directly applied her same methodology to weaning Pickle off her feeding tube, and Baby Bear was done with potty-training in about a week. That doesn't mean we are accident-free - although it's been several weeks with nothing but night-time incidents - but that he understands what is supposed to happen and is learning how his body works to be able to do what he should do. And it was remarkably less stressful this time around. I vote for numbers 1 and 2 as your best ideas for this post. You said free Beck and U2 concert ticket?!? Lucky you!